> Click here to view a matching bracelet. 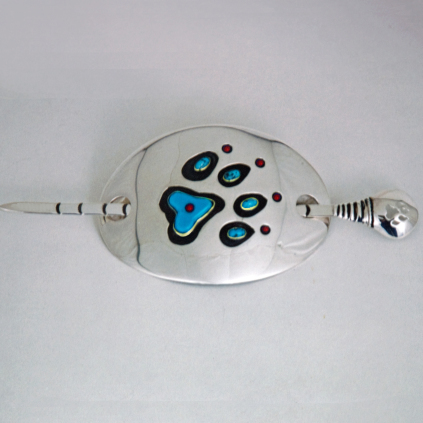 > Visit Zhaawano's Art Blog to read about the symbolic meaning and the story behind this unique silver and gold hair buckle. > SCROLL DOWN to read the traditional Ojibwe Anishinaabe story of how the flooded world was recreated with the aid of Wolf. “The first mother of the Anishinaabeg was once an AADIZOKAAN, a supernatural being residing alone in the sky. Her name was GIIZHIG-OO-KWE, or Sky Woman. GICHI-MANIDOO, the Creator of Earth and Skies, pitying her loneliness, sent a male aadizookaan to her to keep her company. 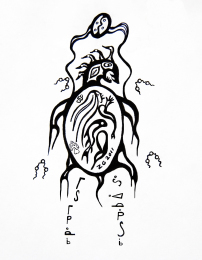 ANIMIKII (Thunder), for that was his name, traveled to the sky lodge of GIIZHIG-OO-KWE and from the union that took place were born the ANISH-I-NAAB-EG (a twin brother and sister), whom she planned to place on the back of a giant MIKINAAK (snapping turtle). But first GIIZHIG-OO-KWE had to convince MIKINAAK to lend his back to the re-creation of the world, because at that time the world was inundated with water below her and most animals had been drowned in the Great Flood that had hit the First World. As Sky Woman noticed that a few animals had survived the flood she called to her aid the giant turtle. He came to the surface so that she could sit on his back and call others to her side. Maang (the loon), Amik (the beaver), Nigig (the otter), and Wajashk (the little muskrat) were among her helpers. That day, long ago, after she had descended from her sky lodge to the newly-created world in the shape of a turtle’s shell, dancing all the way down in a sacred manner, she spoke to the water animals as follows: 'I don't have all the powers of creation that GICHI-MANIDOO has. - Pen and ink illustration by Zhaawano Giizhik. All day long the water animals took turns trying to reach the soil covered by the great depth of water but to no avail. At the end of the day it was only Wajashk the little muskrat, not used to swimming in deep water, who had not given it a try. The brave little animal decided that with no one else available to help it was up to him to do the job. He took many deep breaths and dived down and down. As he finally came back to the surface Wajashk had clutched in his paw the soil from the bottom of the sea. Gratefully GIIZHIG-OO-KWE took the soil, dried it and breathed life into it, then rubbed it on the turtle's back. She rubbed the soil round and round and as she did so an island took shape above the water. GIIZHIG-OO-KWE ordered MA'IINGAN (Wolf) to move over the new soil. MA'IINGAN walked in wider and wider circles; some say it took him 14 summers to complete the job . And so the Earth was recreated. Forever after the Anishinaabeg called the world MIKINAAK-O-MINIS, or Turtle Island."